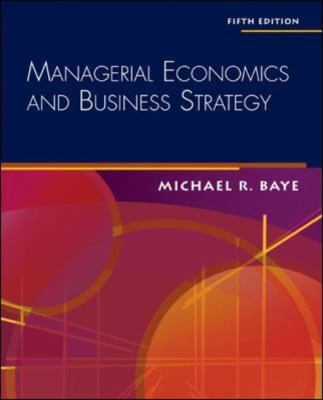 Baye's Managerial Economics and Business Strategy has become the best-selling managerial economics textbook. It was the first textbook to blend tools from intermediate microeconomics, game theory, and industrial organization for a managerial economics text. Baye is known for its balanced coverage of traditional and modern topics, and the Fifth Edition continues to offer the diverse managerial economics marketplace a flexible and up-to-date textbook. Baye offers coverage of both the basic concepts of managerial economics as well as frontier research in his chapter on advanced topics. The Fifth Edition also offers a detailed, real-world case study that explains how book theory translates into action in the business world. And the Data CD that comes with each book also contains eight "mini cases" that cover such high-profile businesses as Microsoft, Visa, and Staples.Baye, Michael is the author of 'Managerial Economics And Business Strategy ', published 2005 under ISBN 9780073050195 and ISBN 0073050199. Loading marketplace prices 41 copies from $0.49 How does the rental process work?